Published: Aug. 25, 2018 at 06:49 p.m.
Houston Texans wide receiver Quan Bray punches in a quick 3-yard touchdown. Texans answer with a 41-yard game-winning TD! Published: Aug. 18, 2018 at 11:26 p.m. 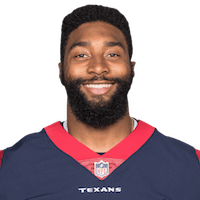 Published: Aug. 9, 2017 at 09:24 p.m.
Houston Texans safety Corey Moore intercepts Panthers quarterback Joe Webb.